Web Appearances: Flattering or Insulting? Lately my photo appeared on several websites. Some of them seem pretty nice but others not so much. I’m going to post the links in order of how much I like them. I am going to be on one of their music videos too! Twitter mania! I am sponsoring a game of Rodent Jeopardy! on Twitter starting Black Friday (November 27th) at 7:00 am Central Time. To join in the fun, use #RodentJeopardy on twitter. If you haven’t already started tweeting, now is the time! Get an account and join the fun. If you’re not already following me on Twitter, you should start! 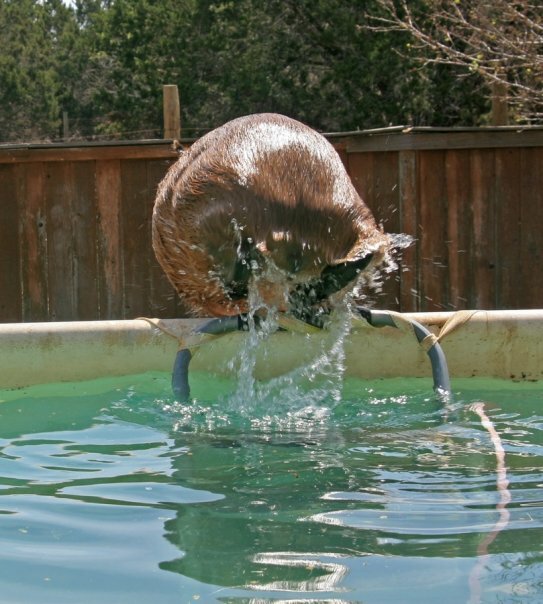 Find out when I’m eating, when I’m sleeping, I even tweet from the pool! @CaplinRous. Most importantly, in order for you to play, I must be following you. Send me a DM (direct message by putting “d ” as the first part of your tweet). If it bounces, send me a regular tweet message (@CaplinRous) and ask me to follow you so you can play. This game of Rodent Jeopardy! will be sponsoring my new favorite charity, Hero Rats! Check them out. They are real land-mine-sniffing, tuberculosis-diagnosing rats! For every player (anyone who answers at least one question), I will donate $1 US. For each point earned by any player, I will donate an additional $0.01. In the last game that would have been $45 for the players PLUS $38 for the points! So play hard and play often to help the Hero Rats clear land mines in Africa. Response must be in the form of a question DMed to @CaplinRous. Whoever gives the first correct response chooses the next block to be uncovered. I will tweet the time the next answer will be revealed after receiving at least one correct response. This page will be updated with the revealed blocks as the game progresses so check back often! Each of the first five correct responses earn the block value plus extra points. The first correct response earns the block value plus five. The second earns the block value plus four, etc. All correct responses after 5th are awarded 1/2 block value. No points are deducted for an incorrect response. After all the blocks have been revealed, there will be one round of Rodent Final Jeopardy! Only the top 10 players will be scored on this round. For Final Jeopardy, each player will DM me with the amount the intend to “wager” before the round starts. DM me with amount of wager. Can wager any number of points up to your total points. Incorrect guess results in loss of 1/2 pts wagered. 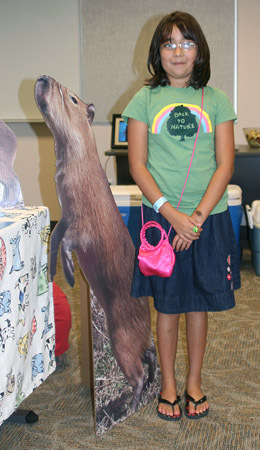 1st place: A signed copy of Celeste and the Giant Hamster and a Caplin Rous 2010 Calendar. 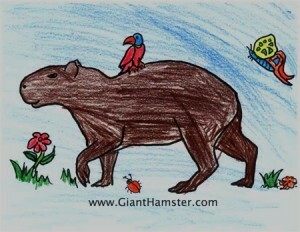 2nd place: A signed copy of Celeste and the Giant Hamster. 4th place gets choice of 2 things not chosen by 3rd place winner. 5th place gets whatever is not chosen by 3rd and 4th place winners. 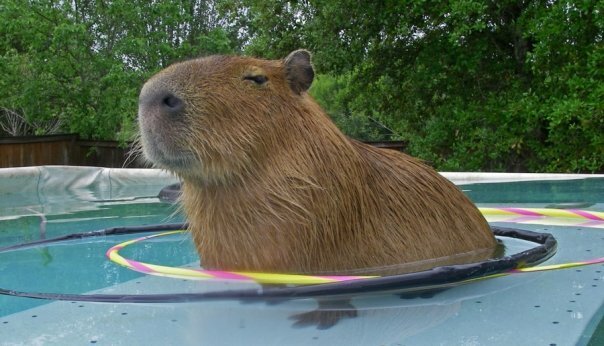 Download Chapter One of Celeste and the Giant Hamster for FREE. 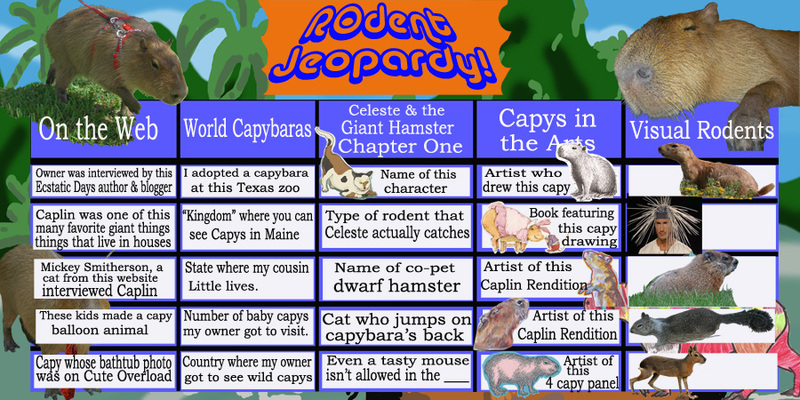 Make sure you read it before Rodent Jeopardy! starts! 10: Who is Jeff VanderMeer? 40: Who are Emily & Elizabeth? 10: Where is San Antonio Zoo? 20: What is a mouse? 10: Who is Bill Peet? 30: Who is Terry Stanley? 40: Who is Grace Warrington? 50: Who is Jeff Djayasaputra? 10: What is a prairie dog? 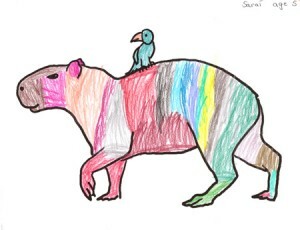 20: What is a porcupine? 30: What is a groundhog? 40: What is a squirrel? 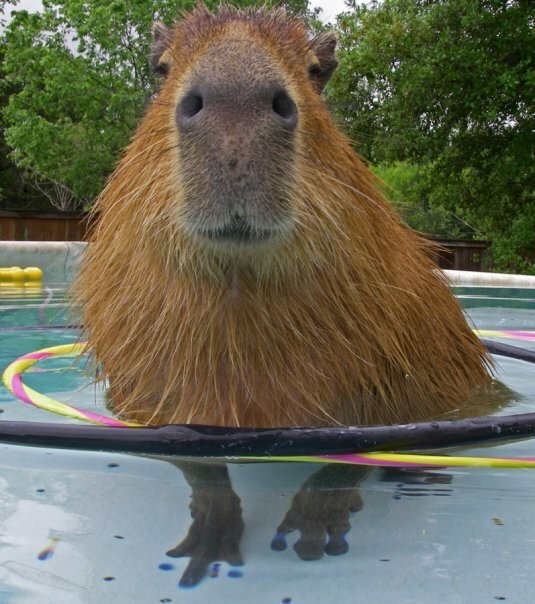 50: What is a Patagonian Cavy or Mara? 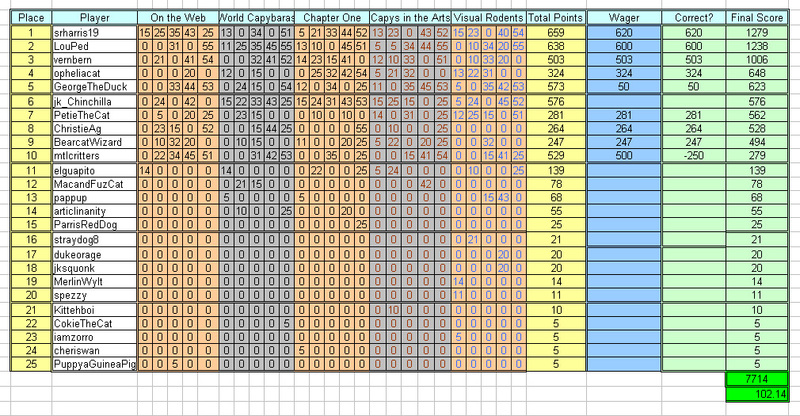 Rodent Jeopardy earned $102.14 which owner will donate to Hero Rats! Congratulations to everyone! Thanks for playing. As hard as it was to pull myself away from Caplin for a whole day, I spent this past Saturday at a book festival in Georgetown, Texas. It’s coming up on the holiday season and it seemed like a good idea to get Celeste and the Giant Hamster out in the public eye. 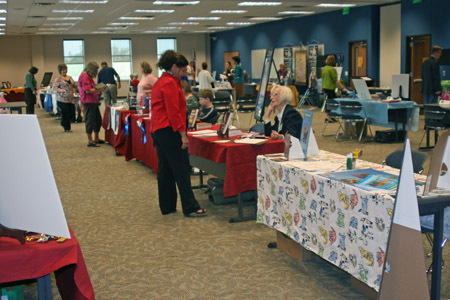 This is the first book festival I’ve ever attended, either as an author/participant or as library patron, even though I am an avid reader. I paid my twenty bucks and got my own table, shown above. Celeste, my granddaughter and the impetus for writing the book, came and spent a little time with me. But mostly she went to the other book festival activities like the magic show and story-telling. She and the other kids seemed to have a great time. But the meet-the-authors part of the festival was tucked away in a room upstairs and there were no activities up there. 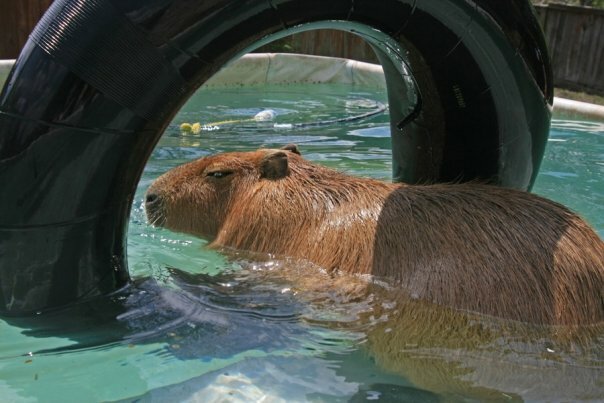 For example, a live capybara activity would have been great. Or they could have just had short book-readings. Or they could have had authors talking to kids about what it is like to write. But, alas, the meet-the-authors section was not well attended. Nevertheless, I had a great time. 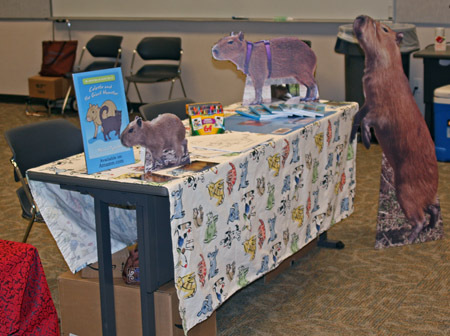 I met some interesting people, gave out a lot of cards for this blog, talked about capybaras to everyone, and had interesting discussions with some of my fellow authors. 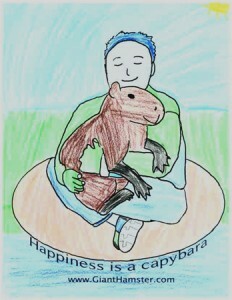 I also gave away many copies of the capybara coloring pages and some kids even colored them at my table (I colored two myself!). If you colored one of the pages, please send me a scan of it to post here, you can use the Contact tab on the left sidebar. It would be great to see your artistic endeavors. The Meet-the-Authors room at the book festival. And I learned that Georgetown, Texas has a totally awesome library. It has wonderful open stacks, great art in the hallways and sculpture outside, an actual café in the library with great food. But the best part is the children’s section. 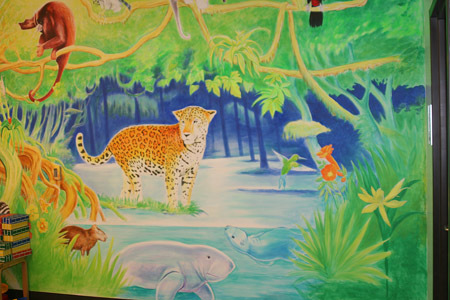 It has a South American jungle theme with murals painted on all the walls. 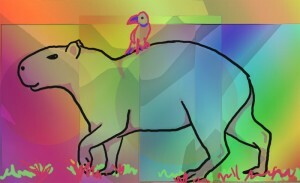 Please notice the capybara peeking out of the grass near the bottom left corner. How great is that? 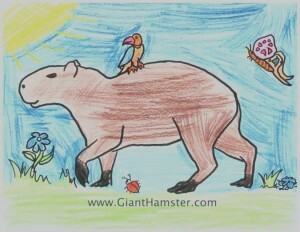 Of course, whoever painted it had no idea how large capybaras are because that one would be a midget. Or maybe the jaguar is a giant. 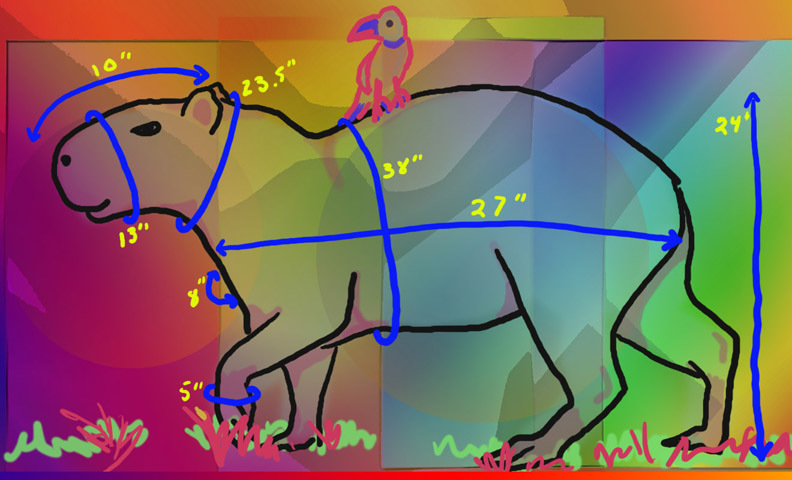 Or maybe nothing is drawn to scale. 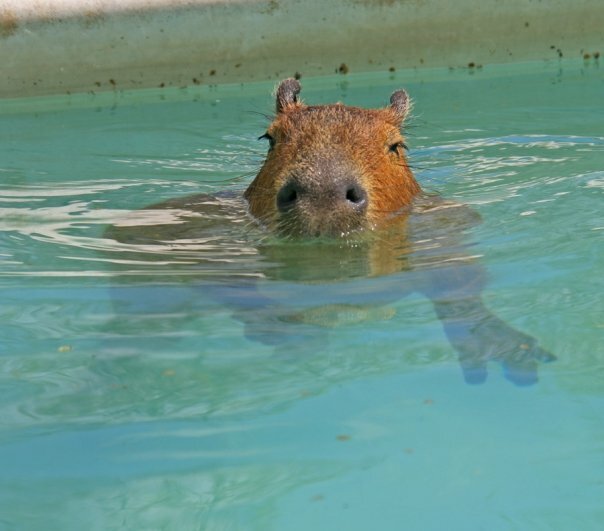 At any rate, I would love to do a book reading / capybara encounter and have Caplin in front of that mural. 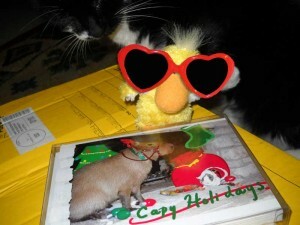 I donated a copy of the book to the library and gave them one of Caplin’s cards. Hopefully they’ll contact me about it. If you haven’t read the first part of my FACute, you can find it here, it’s pretty good, if I do say so myself. But I always intended to add more information, it’s just hard to get around to it, but here we go! 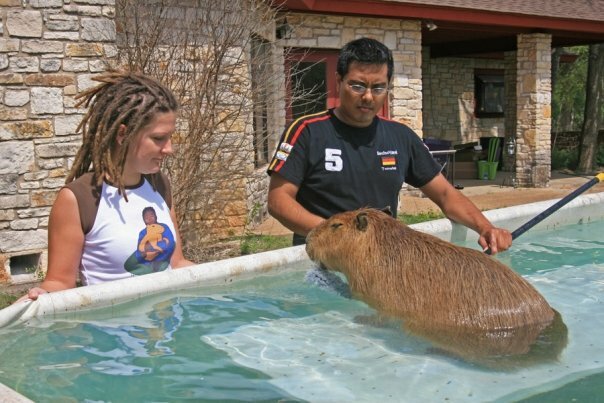 One thing I get asked a lot is how fast capybaras grow. That’s a good question but I don’t have a really good answer. The only thing I know is how fast I grew. 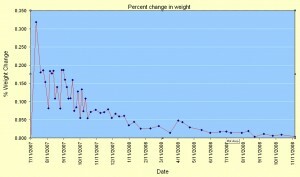 When I was a baby, my owner was quite conscientious about weighing me. And she made all kinds of fancy charts too. 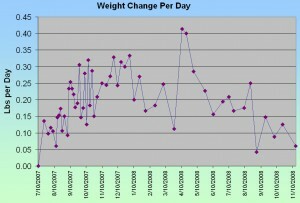 Here’s a chart of my weight up until I pretty much leveled off at 100 lbs. So what did all result in? Beautiful me! 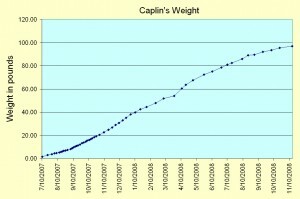 The image below shows all of my measurements as of October 2009. Anyone who knows me knows that I love art. 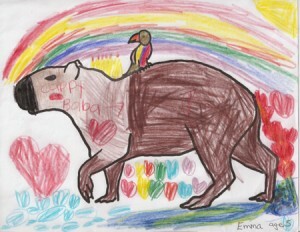 Specifically, I love art featuring capybaras, and especially specifically I love art featuring me. 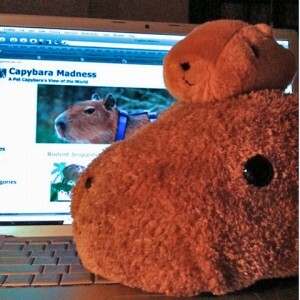 You may have seen the other posts in my Capybara Art category (press the link on the left sidebar). Those are really great pieces of art and I love them all. Actually, I can hardly even begin to give proper thanks to my original stalker Jim Perry, to Terry Stanley, Jeff Djayasaputra and, most recently, Grace Warrington. 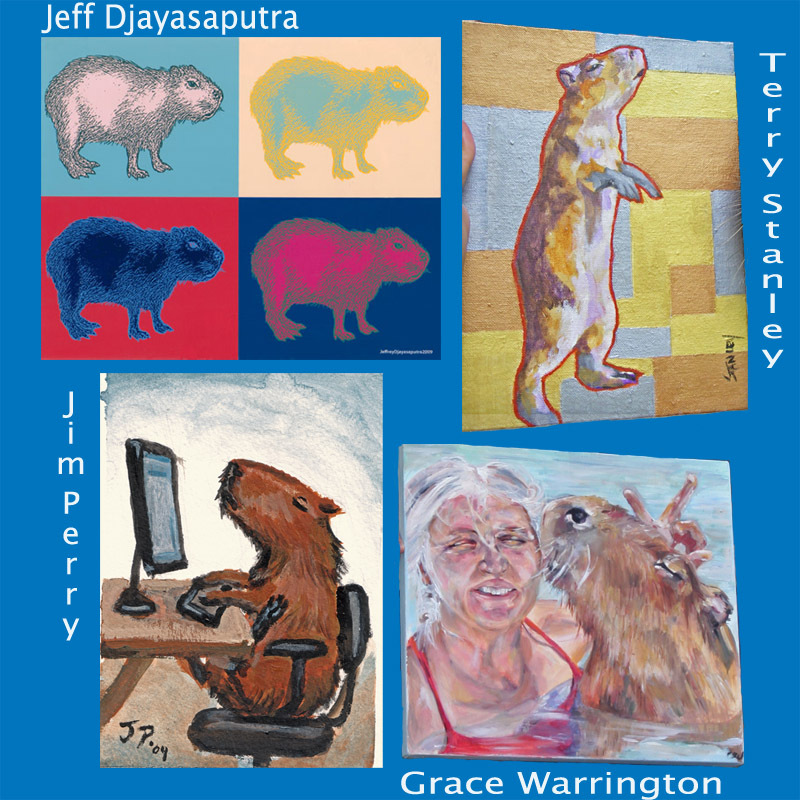 They are all professional artists with real affinities for animals and capybaras in particular. What amazes me is how many wonderful ways there are to depict me in art. The four paintings above are all so unique in style and medium and in the feelings that they invoke in the viewer. I couldn’t possibly say which I like best. I honestly love them all! 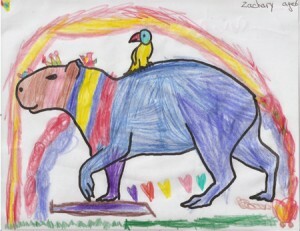 With this in mind, it occured to me (and my owner) that one way to connect with school kids is through art and through their participation in the creation of art. That is why we have started handing out Caplin Coloring Pages when we go to schools. My owner did the drawings and, as she says, she can draw but she is no artist! But the kids can fill in the artist part with the outline on the coloring page just serving as a template. 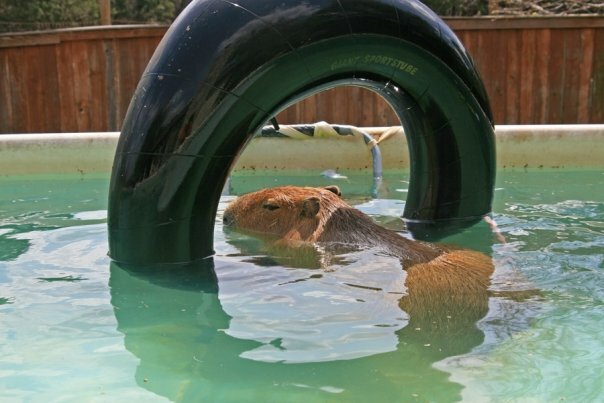 We are hoping that this type of activity will also help the kids understand and appreciate capybaras. Coloring my likeness should help them remember what I look like. That is the theory anyway. 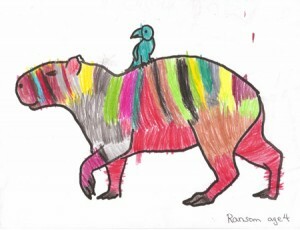 Two of the schools I went to in October sent me images of some of the colorings done by their students. I think they are wonderfully creative. Most of them are based on this drawing of me. 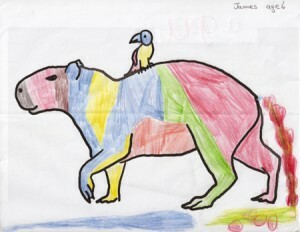 The kids at the San Marcos Montessori saw this picture which helps to explain their color choices. I think I look pretty cool all colorful like that. The kids did a great job! We visited a 2nd grade class at Kiker Elemetary School. 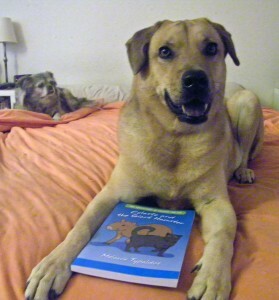 My owner gave them a greater choice of coloring pages partly because they were older and partly because she created more pages. She put more detail on the original page too. And I think you can see that these students did not see her colorful version. Amazing how that affects the coloring style! Pretty great work by all the kids, I’d say! If you’d like coloring pages, please send me an email using the contacts page and I will email you the jpg images. 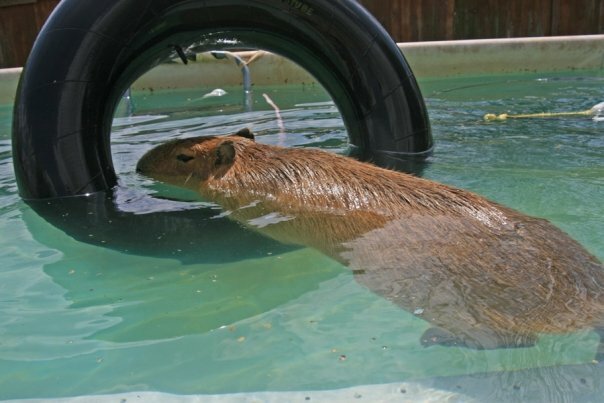 If you are in Central Texas and would like me to visit your school for a capybara encounter, send us an email using the contacts page.